The one-of-a-kind parklet in front of Fabric 8 in the Mission is now on sale for a modest $12,000. Named 'The Peacekeeper', the parklet was created from recycled materials recovered from the San Francisco dump by local artist Erik Otto. The small public space was completed in September 2011 and has been featured in numerous publications. According to Fabric 8's website, amenities in the sale include four custom-made bean bags and a low-voltage lighting system inside the house. Delivery and installation are also included if it's not moving too far. Finally, the beautiful little parklet can be purchased in part or whole (although the olive tree and steel foundation don't count). San Franciscans have embraced the movement, which converts parking spaces into green outdoor areas, as more than just the fleeting phenomenon that marked its origin. Now a worldwide phenomenon, PARK(ing) Day began in 2005 when San Francisco design studio Rebar converted a metered parking space in Downtown San Francisco into a public park for two hours—the length of time allowed on the parking meter. When the meter ran out, Rebar's polite urban activists rolled up their astroturf and went home. 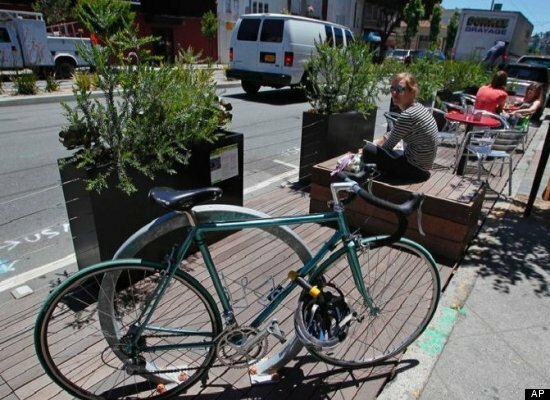 As word of the project went viral online, cities across the country started asking Rebar to make "parklets" for them too. Instead, the firm put out a how-to guide for anyone interested in creating parklets and encouraged people from across the country to construct their own. From those auspicious beginnings, PARK(ing) Day has grown to include participants from as far away as Stockholm, Sweden and Sydney, Australia. Last year's PARK(ing) Day saw parklets taking over 800 parking spaces in 30 countries on six continents.